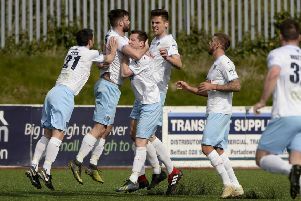 First half goals from Guillaume Keke and Kyle Cherry mean Dungannon Swifts are still searching for their first points of the season after crashing to a home defeat against newly-promoted Ards. That first half brace put Niall Currie’s side in control at the break but they were forced to withstand a strong Swifts fightback in the second period. Indeed the Co. Down men had to see out the final 20 minutes with 10 men after the dismissal of Joe McKinney for violent conduct. Dungannon made one change from Saturday’s defeat at Glentoran with Andrew Burns returning at right-back while Ards made two switches, both enforced, with ex-Swifts players Fra Brennan and David McCullough dropping out. And it was Swifts who had the perfect chance to go in front after seven minutes when cracking ball from midfield released Burns who was taken down inside the area with the referee pointing to the spot. Ally Teggart took responsibility, but crashed his kick against the crossbar. The deadlock was finally broken just before the half-hour. A ball into the box was knocked into Keke’s path and he turned smartly before firing home with a terrific right-foot effort. Ards doubled their lead a minute before the break, a cross picking out Cherry who guided home a sublime header. Dungannon improved after the break and pulled a goal back in the 65th minute. A flowing move brought a series of clever passes before Burns applied the finish, rifling home with his left foot. And a tricky task for Ards became trickier still when they lost McKinney to that 70th minute red card after he appeared to lead with the arm when challenging for the ball. With the extra man, Dungannon pushed for an equaliser but Ards held on.